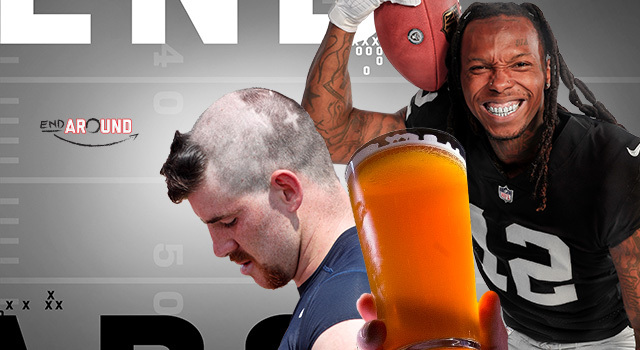 Preseason trolling, rookie haircuts and free beer! Published: Aug. 17, 2018 at 12:32 p.m. Updated: Aug. 17, 2018 at 01:14 p.m. Welcome to the End Around, a weekly look back at the world of the National Football League. Dan Hanzus serves as your guide. Youâve stood by us through it all. We love you for it, and so does @budlight. This is a fun marketing campaign, and I respect the Browns for having a sense of humor about their plight. It's a thin line between likable self-awareness and making light of the cosmic fail that is 0-16, and I think the Browns are on the right side of things. While we're here, I'm just going to stan for ice cold Bud Light, which I'll take every time over your Fancy Boy IPA. Fight me. When the clock strikes zero on the Browns' first win -- their last win was in Week 16 of the 2016 season against the San Diego Chargers -- the electromagnet that keeps the fridges locked will be turned off through a WiFi connection, opening all of them for fans to enjoy free of charge. The electromagnet will be turned off through a WiFi connection?!? This is something that we, as a society, can do? Why do we make things so hard for ourselves? We're brilliant! If you were curious how Iggles fans would handle finally reaching the summit of Mt. Lombardi, there's a taste. Not how I'd spend $5,000 (this is a conservative booking-fee guess for an airplane-with-signage guy), but hey, whatever does it for you. Eagles and Patriots supporters are both pumped so full of swagger right now that a showdown between the two fanbases is like King Kong vs. Godzilla. Yep, the ol' unstoppable force meets immovable object. Here's the thing about Terrelle Pryor's flinch: You would do the same exact thing! And if you disagree, you're lying to yourself. When someone suddenly twitches into an aggressive posture -- when someone is literally winding up for a punch -- you're going to flinch. So all the talking-head hulks and Twitter titans need to simmer down. I'm more curious why everyone on the Redskins apparently hates Terrelle Pryor. And why does the overriding take on Pryor seem to be, "God, I wish I could punch that guy"? This is one of those super-annoying mysteries where you know a substantial number of people know the truth, but you don't know those people. If I were Pryor, I'd look at the Jets as my transfer college. It's a fresh start, buddy. Whatever you did at the last place, do the opposite. It will probably work out for the better. This is so impressive. If I were the Bears, I'd find out whatever the Packers are about to give Aaron Rodgers, then give Anthony Miller one dollar more. He is obviously the future of the sport. I especially love the ball-between-his-legs shimmy move before the final catch; it's like watching a man making an artful dash for a fresh roll of toilet paper on the opposite side of the bathroom. Honest question: How many do you think you could catch? If your life depended on it, could you get two? Three? Four? I'd reckon most of us would struggle to handle a single ball -- corralling a punt is tricky business, even for a lot of pros. I think I could handle a pair, at which point I'd head directly to the bar for nine hours of celebration. "Got me micâd today just so you knowâ¦"
I feel like it would be very hard to be myself while mic'd for sound. I'd probably end up sounding like Shy Ronnie. I'd also be, like Sean McVay, hyper-vigilant about letting people in my orbit know I was wired. That just seems like a moral obligation. I can't believe McVay doesn't lose his voice by the end of every practice. Maybe he has sneaky Ariana Grande-level pipes. In the words of Don Corleone: "Look how they massacred my boy!" Drew Brees has led the NFL in passing seven times. He's thrown for over 5,000 yards five times, but he still has yet to win an MVP award. Is he the best player in the NFL to not win the MVP award? Is Jerry Rice a better player than Drew Brees? Hmmmm. Brees has enjoyed an incredible career. It's crazy he hasn't received the trophy once. His best chance was probably 2011, when he led the league in completions, (468), yards (5,476), touchdowns (46) and completion percentage (71.2) and was still outvoted 48-2 by Aaron Rodgers, who played out of his mind for the 15-1 Packers. Brees probably had a top-five season at the position -- Rodgers probably had the best. Tough timing. "We're calling Martavis the 'White Tiger.' I used to go to Busch Gardens in Tampa. We called (Joey) Galloway the 'White Tiger.' You go to Busch Gardens, and they have a white tiger. Thirteen times I went to Busch Gardens. The white tiger always was in his cage. Well, the white tiger came out today. Bryant came out." -- Raiders coach Jon Gruden, just the latest coach tasked with unlocking the boundless potential of Martavis Bryant. You know you're a legend when you can perform a nearly-five-minute rendition of the "Star-Spangled Banner" at an NFL game and everyone is super pumped about it afterward. So long to the ultimate diva.